Comm Eye Health Vol. 14 No. 39 2001 pp 40 - 42. Published online 01 September 2001. While the prevalences of morbidity and visual impairment due to primary open angle and angle-closure glaucomas have been fairly well established by population surveys in the west and, recently, in the developing world, the issue of blindness from secondary glaucomas has received little attention from most investigators. Individuals with secondary glaucoma tend to report promptly to the ophthalmologist since there is often marked reduction in visual acuity, apart from pain and ocular discomfort. As a consequence, these are largely self-reported. Information on secondary glaucomas in published eye surveys is limited and the cause of glaucoma seldom identified, although in several prevalence studies secondary glaucomas are numerically important (Table 1). Based on the WHO Blindness Data Bank, Thylefors and Negrel, in their world estimate of glaucoma blindness, found it was not possible to determine the number of blind from secondary glaucoma, although they estimated the world prevalence to be 2.7 million.1Quigley emphasised that few studies describe secondary glaucomas as a separate entity and most investigators do not provide the criteria used in defining this potentially blinding disorder. The mean prevalence of this condition is 0.44 [SD 0.36%] or 18% of the mean prevalence of primary open angle glaucoma in the world.2 Quigley estimated that 6 million people in the world have secondary glaucoma compared with 67 million with the primary glaucomas. The Glaucoma Services at the Aravind Eye Hospital, a large tertiary eye care centre in South India, registered 367 individuals with various secondary glaucomas (Table 2) in the year 2000. This represents about 6.0 % of total new cases of glaucoma seen annually. Lens induced glaucomas due to hypermature cataracts are an important cause of secondary glaucoma in the developing world. Cataract accounts for 50-80% of the world’s blind and in the developing world financial, cultural and psychosocial barriers to accessing excellent surgical services still exist. There is an ever increasing backlog of cataract due to the population explosion, increased life expectancy and low productivity in terms of utilisation of the available surgical services. The uptake of eye care services by the rural community has also been suboptimal in countries like India3 where lens induced glaucomas are a common cause of ocular morbidity. It should be recognised that reduced vision is not the only indication for cataract surgery. An enlarged, cataractous lens can cause phacomorphic glaucoma (see below), the treatment of which is removal of the lens. Under VISION 2020, the global initiative of the WHO and voluntary service organisations, to reduce significantly ‘avoidable’ blindness by the year 2020, it is intended that cataract surgeries performed will increase, particularly in the developing nations. Currently, it is estimated that about 12 million cataract operations are performed each year the world over. VISION 2020 aims to achieve a target of about 20 million cataract operations by the year 2010 and ultimately reach a target of 32 million people receiving cataract surgery annually by 2020. Although recent advances in sutureless small incision cataract surgery and phacoemulsification and improved IOL designs have resulted in vastly superior outcomes with reduced complications related to wound repair and secondary glaucomas, several problems still remain. These require training of ophthalmologists in the emerging, new techniques and tackling complications peculiar to the new surgical methods, which may include glaucoma and inflammation secondary to retained lens fragments. These measures will also reduce complications such as pseudophakic glaucoma, for example, yet another significant cause of secondary glaucoma. The cataractous lens may become swollen (intumescent) which causes relative pupil block, the iris root is moved forward and this may result in blockage of outflow of aqueous fluid at the angle of the anterior chamber. This is a secondary form of angle-closure glaucoma. Lens material may cause blockage of outflow of the aqueous at the drainage angle and this may occur after injury (including cataract surgery) or when lens material leaks through the lens capsule of a mature/hypermature lens. Macrophages, attempting to remove this abnormal material, together with the abnormal lens material itself may cause blockage at the angle of the anterior chamber. This is described as phacolytic glaucoma. ‘Lens-induced’ glaucoma, in the broadest sense of the word, can be prevented by excellent cataract surgery, by operating on unilateral dense cataracts, and on second eyes if it is considered likely that the patient will not return for follow-up. Neovascular glaucoma may occur in diabetics where abnormal new blood vessel formation has occurred causing disturbance to the outflow of aqueous at the angle of the anterior chamber. Ocular neovascularisation and glaucoma may develop in 33-64% of eyes with untreated, proliferative diabetic retinopathy.3 Diabetic retinopathy is a leading cause of blindness in persons aged 20-74 years. With improved treatment available for diabetes, life expectancy has been greatly increased, resulting in many more individuals with diabetic retinopathy. Effective metabolic control of diabetes in the population, efficient screening for early detection and treatment of diabetic retinopathy and retinal photocoagulation of eyes with proliferative diabetic retinopathy are vital in prevention and management of neovascular glaucoma. Glaucomas which remain uncontrolled with lasers and conservative therapy may be treated with cyclophotocoagulation with the newer Nd: YAG or semiconductor diode lasers with the option of glaucoma filtering surgery and adjunctive antifibrosis agents. Neovascular glaucoma (rubeotic glaucoma) results from angle-closure secondary to a fibrovascular membrane in the anterior chamber due to ocular diseases characterised by retinal ischaemia and angiogenesis. Thrombosis of the central retinal vein will result in disturbance of the circulation within the eye and this may result in new vessel formation within the anterior segment. These abnormal blood vessels may affect the angle of the anterior chamber, where the blood vessels can be visualised, and secondary glaucoma can result. Ischaemic central retinal vein occlusion (thrombotic glaucoma) is the second most common cause of ocular neovascularisation and glaucoma is seen in 58-86% of these eyes.6 Essential hypertension and primary open angle glaucoma remain the principle aetiological factors in the pathogenesis of central retinal vein occlusion. Ideally, eyes with conditions where neovascular glaucoma is likely should be identified early, and prophylactic panretinal laser photocoagulation given. Fundus fluorescein angiography (FFA) can be used to detect retinal capillary closure in eyes with central vein occlusion, and this should be done 6-8 weeks after the onset, once the retinal haemorrhages have cleared. All diabetics with retinal neovascularisation should have panretinal photocoagulation. If facilities are not available for FFA, clinical signs of ischaemia should be used to detect eyes at high risk (i.e., extensive cotton wool spots). Treatment by panretinal photocoagulation of established ‘rubeotic’ glaucoma is often not successful, as permanent changes occur in the drainage angle. Future research is directed at evolution of the inhibitors of angiogenesis to combat neovascular glaucoma. Antibodies to vascular endothelial growth factor(VEGF), the principle peptide involved in angiogenesis, have been succesful in reversing new vessels in primate eyes.7 Suppressor gene therapy to prevent predisposition of individuals to neovascular glaucoma is also a distinct possibility in the future. Ocular injuries have been recognised as a common cause of monocular blindness8 in several studies and secondary glaucoma is one of the principle causes of visual impairment. Although there is no large population based series study on the prevalence of the traumatic glaucomas, the Aravind Comprehensive Eye Survey has found a prevalence of 0.2% of glaucoma in individuals with trauma (unpublished data). Most ocular trauma and ocular morbidity has been reported in males in the younger age group, accounting for severe economic burdens in terms of days lost in work and expenditure on treatment. Early decognition of trauma and elucidation of the mechanism of glaucoma is vital to prevent visual loss. Degenerate red blood cells may block the trabecular meshwork at the angle of the anterior chamber and there may be a secondary rise of intraocular pressure. A total or almost total hyphaema may be associated with a rise in pressure and, also, blood elements may penetrate the cornea resulting in corneal blood staining – which is very slow to clear. This type of hyphaema should be surgically released by paracentesis. Further, if the haemorrhage has been the result of a severe blunt injury, for example, with damage to the trabecular meshwork and the angle of the anterior chamber, later healing with fibrosis may cause a severe type of secondary raised intraocular pressure (post-traumatic angle recession). Longer term use of topical and systemic corticosteroids can result in a rise of intraocular pressure, which is usually reversible once the medication is discontinued. Glaucoma due to the indiscriminate use of topical corticosteroids for allergy and spring catarrh has left children blind from glaucomatous optic atrophy. Ophthalmologists have a pivotal role to play in preventing such needless blindness by enabling appropriate education of health workers and the general public, together with control of the availability of corticosteroids. In uveitis, cells and proteins in the anterior chamber disturb the normal outflow of aqueous fluid through the trabecular meshwork, causing raised intraocular pressure. Using a focal light and magnification a ‘flare’ may be seen in the anterior chamber-like a shaft of sunlight streaming into a room full of dust. As a result of the inflammatory reaction within the eye there may be adhesions between the pupil margin and the anterior lens surface (posterior synechiae) and/or in the angle of the anterior chamber (peripheral anterior synechiae). The pupil will dilate irregularly if posterior synechiae are present. Occasionally the adhesions may be total, affecting the entire pupil margin, and this is described as seclusio pupillae. The iris bows forward as aqueous fluid cannot pass through the pupil and this further embarrasses the drainage angle of the anterior chamber-described as ‘iris bombé’. Glaucoma secondary to uveitis is an important clinical entity, often with severe visual impairment. The management is complex since complicated cataract, macular oedema and media haze largely contribute to ocular morbidity apart from glaucomatous optic nerve damage. It has been reported that between 5.2 and 19% of eyes with uveitis develop secondary glaucoma.9 Though most uveitic entities are idiopathic, known causes include infections like leptospirosis, toxoplasmosis, AIDS, onchocerciasis and drug-resistant tuberculosis. Adequately combating these microbial infections can significantly reduce ocular morbidity due to uveitis – apart from addressing the cause of elevated ocular pressures and the institution of appropriate therapy. In certain eyes, pigment particles may circulate abnormally in the aqueous fluid, and these in turn may cause blockage at the drainage angle. There is some debate as to whether this form of glaucoma should be described as primary or secondary laucoma. Abnormal accumulation of particles (not unlike dandruff in appearance) may accumulate in the anterior eye. This abnormal material can cause blockage of the drainage angle. 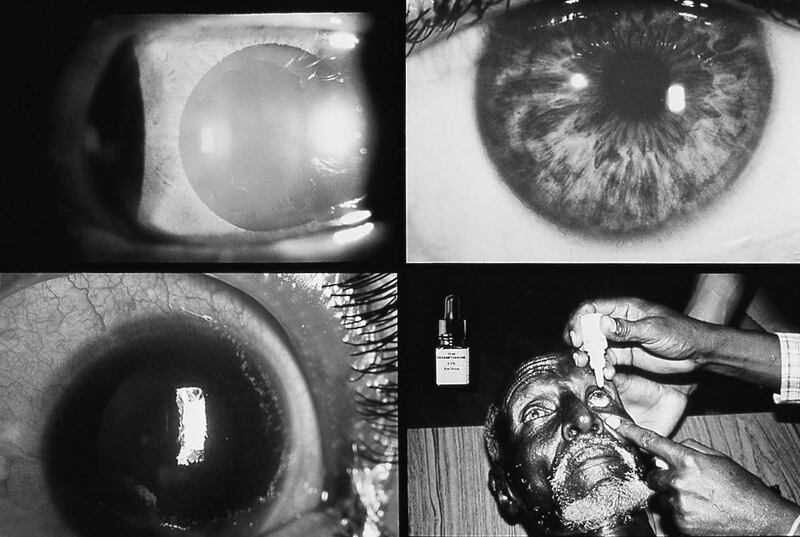 Pseudoexfoliative glaucoma is particularly found in Sudan, Somalia, Ethiopia and Tanzania. It is less common in West Africa. Some consider this to be a form of primary glaucoma. This acute toxic disease is caused by the unintentional ingestion of Argemone mexicana oil, an adulterant of cooking oils. It has been reported in India, Mauritius, Fiji, Bangladesh and southern Africa. Rash, oedema of the lower limbs, gastrointestinal and cardiovascular disturbances may be accompanied by a secondary form of glaucoma and retinal vascular abnormalities. Health education about avoiding eye injuries. If there is, then treatment should be aimed at lowering the IOP, reducing any associated inflammation, and treatment of the underlying cause(s) (i.e., removal of a hyphaema; removing a hypermature lens), plus other interventions to restore sight. Long term treatment to control the IOP may be required, or glaucoma surgery once the eye has become quiet and stable. If there is not the potential for useful vision (i.e., secondary glaucoma due to CRVO or end stage diabetic retinopathy), the aim of management is to give symptomatic pain relief (e.g., mydriatics and steroids, injection of retrobulbar alcohol). Alhough secondary glaucomas numerically represent a smaller percentage than the primary forms of the disease, they nevertheless cause significant ocular morbidity and visual impairment. Early identification of the primary ocular and systemic diseases that predispose to the secondary glaucomas would play a significant role in limiting the burden of needless blindness. 1 Thylefors B, et al. Global data on blindness: an update. WHO/PBC/94.40, World Health Organization, 1994, Geneva. 2 Quigley H A. The number of people with glaucoma worldwide. Br J Ophthalmol 1996; 80: 389-393. 3 Fletcher A, Thulasiraj RD, et al. Low uptake of eye services in rural India: A challenge for programs of blindness prevention. Arch Ophthalmol 1999; 117:1393-1399. 4 Grant W M. Management of neovascular glaucoma. In: LeopoldIH,ed. Symposium on ocular therapy, vol 7, St.Louis, The CV Mosby Co,1974. 5 Madsen P H: Rubeosis of the iris and haemorrhagic glaucoma in patients with proliferative diabetic retinopathy. Br J Ophthalmol 1971;55: 368-371. 6 Sinclair S M, Gragoudas E S. Prognosis for rubeosis iridis following central retinal vein occlusion. Br J Ophthalmol 1979; 63: 735-742. 7 Adamis A P, et al. Inhibition of vascular endothelial growth factor prevents retinal ischaemia- associated iris neovascularisation in a non human primate. Arch Ophthalmol 1996; 114: 66-71. 8 Katz J, Tielsch JM. Lifetime prevalence of ocular injuries from the Baltimore Eye Survey. Arch Ophthalmol 1993; 111: 1564-1568. 9 Panek WC, Holland GN, Lee DA, Christensen RE. Glaucoma in patients with uveitis. Br J Ophthalmol 1990; 74: 223-227.